Although most people don’t realize it, there has been an interest in the Western part of America since before even the Jamestown Colony was founded. In fact, it was the Spanish explorer Juan Rodríguez Cabrillo who is credited with the first sighting of what is today Southern Oregon in 1543. But, it was Sir Francis Drake who landed in Oregon’s Nehalem Bay in 1579, where he set up camp as he made repairs to his ship. Before setting sail once more, he claimed a section of land under the Symbolic Sovereign Act for England. Things went quite again until 1774, when Oregon became a valuable trade route to Asia. And then between 1805-1806, the Lewis and Clark expedition went through the land, staying for four months near the Colombia River. Many more people came and explored Oregon as well, over the years. Eventually, between 1842-1843, the famous Oregon Trail was established. This 2,170 mile stretch of trail—originally laid out by fur traders between 1811 and 1840—was used by emigrants heading to different areas of the West for new, and hopefully better, lives. Now, Oregon is home to over four million people and their population continues to grow as more and more people discover all the great things that Oregon has to offer. 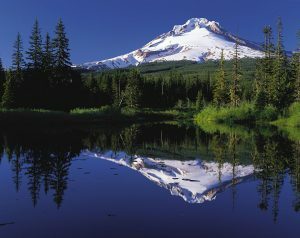 As the 9th largest state in America, Oregon has a number of popular cities that attract many people to visit and live. Regardless of what it is you like or are interested in, there is a city for you in Oregon. Some of the most popular and well-known cities include Portland, Salem, Eugene, and Astoria. Here is what makes each of these Oregon cities so great. Portland is by far the most recognized city in Oregon and also one the largest, although it is not the capital, like many people may think. Due to the geography of Oregon as a whole, the state is full of many natural wonders, and Portland is home to countless beautiful gardens and parks. The International Rose Test Garden, Forest Park, and the Crystal Springs Rhododendron Garden are just three of the natural sites that Portland is home to. It is also home to some incredibly iconic eateries, like Voodoo Doughnuts and Le Pigeon. Besides that, Portland is also home to Portland State University, the second largest university in the state and the Private University of Portland. like the Oregon Garden, Riverfront City Park, and Minto-Brown Island Park. Salem is also home to some great higher-learning institutions, like Willamette University and the Willamette School of Law, Corban University, and Chemeketa Community College. Salem is also home to the Salem Saturday Market and a number of great vineyards. Another popular city in Oregon is Eugene, located just 50 miles away from the Pacific Coast. Eugene is a city that is very popular with people who prefer an alternative, “hippie” lifestyle. But, Eugene is also home to some more of Oregon’s beautiful nature with the Mount Pisgah Arboretum and Hendricks Park. Eugene also has its own Saturday Market and is the location of the University of Oregon, which is also home to the Autzen Stadium, a popular football stadium. People move for so many different reasons. Sit is sometimes for school, sometimes for work or military assignment, to be closer to family, or simply just because. Regardless of whether you are moving to Oregon or away from Oregon, you probably thought a lot about what to do with your stuff. Depending on how big of a move it is for you, you may have considered the idea of selling some of your less important things; furniture, for one, can be pretty easy to replace. Then there is the issue of your car. While you could sell your old car and just buy a new one once you have moved, that can be expensive and time consuming, and leave you without an easy way to get around for a couple of weeks. Driving your current to your new home is also an option, but it is even more expensive. Between the cost of gas, tolls, food, and hotels, it will certainly add up. The easiest way to avoid having to get a new car or paying those crazy costs is to just ship your car to your destination! With this method you simply pay a single flat rate, and the company will pick up your car and get it to the right place, without you having to break a sweat. Whether you are shipping your current car, a classic, or one you bought at auction, there are two main types of shipping for you to choose from: enclosed shipping and open shipping. Both are great options, but companies tend to use them for specific types of vehicle shipments. Fortunately, both options are great, offer insurance, and will ensure that your car arrives where you want it without any issues. Enclosed car shipping involves putting a single car in a closed container on the back of a cargo truck. This helps to protect the car from any potential harm that could befall it due to weather or certain road conditions. Companies tend to save enclosed shipping for specific types of vehicles: sports cars, classic cars, and motorcycles being some of the top categories. This is done because these vehicles tend to be more delicate and need the added protection that comes with enclosed shipping. But, it is important to note that enclosed shipping tends to cost a little more money and can also take a little longer, as drivers will take routes to minimize the number of bumps and construction sites they may have to drive through, which could cause issues for your vehicle. When you see those cargo trucks with dozens of cars arrive at a dealership, you are seeing an open shipping situation. Car transport companies use this option for your everyday SUVs, sedans, vans, and pickup trucks. It leaves the cars open to rain, snow, wind, and even road debris, but cars do not suffer serious damage. It is a more affordable option, and your car will arrive to your destination quicker than it would with enclosed shipping. It is not just the kind of shipping you choose that can affect the price of your vehicle shipping. Everything from the seasons to the price of gas can have an effect on what you can expect to pay. Just as you may struggle to drive through heavy winds, rain, or snow, a car transporter will struggle too. But, they have the added concern of having some very precious cargo. If it is still safe enough for them to make the trip, the company may raise the transport fee to makeup for the added struggle. But, there are also peak points during the seasons where more people are looking to transport cars, which means you can expect to pay more. Summer and spring are the busiest for transport companies, and therefore, more expensive, while colder months like January will be cheaper. It is important to remember that the cost of car shipping is a flat rate that helps to cover hotels, gas, and food costs for the driver. It is also important to keep in mind that gas prices are on the rise, and big trucks use a lot of gas, even if diesel can take them farther, it costs them a lot more. So, the farther the driver has to go, the more gas they will need, and the more you will end up having to pay for your shipment. Another thing that can effect the cost of your car shipping is the car itself. As said before, companies will only ship sports cars, classic cars, and motorcycles via enclosed shipping. But, whether the car is in working order or not can also add to the cost. If the car doesn’t turn on, and the transporter has to make adjustments so that they can load up the car. It may require special tools that they have to rent, which, as a result, can lead to you paying a little more to makeup for those costs. Moving is a big job that can take a whole lot of work. Fortunately, most people have friends, family, or a trusty moving company to help with furniture. But, not so much shipping your car. Fear not, however, because AA car transport is here to help ship your car! Whether you are transporting your car to or from Oregon or somewhere else in the United States, we help ship your car easily and cost-effectively, while saving you time and stress. So, when it is time for you to move, be sure to get quote or call at 1-800-516-3440.